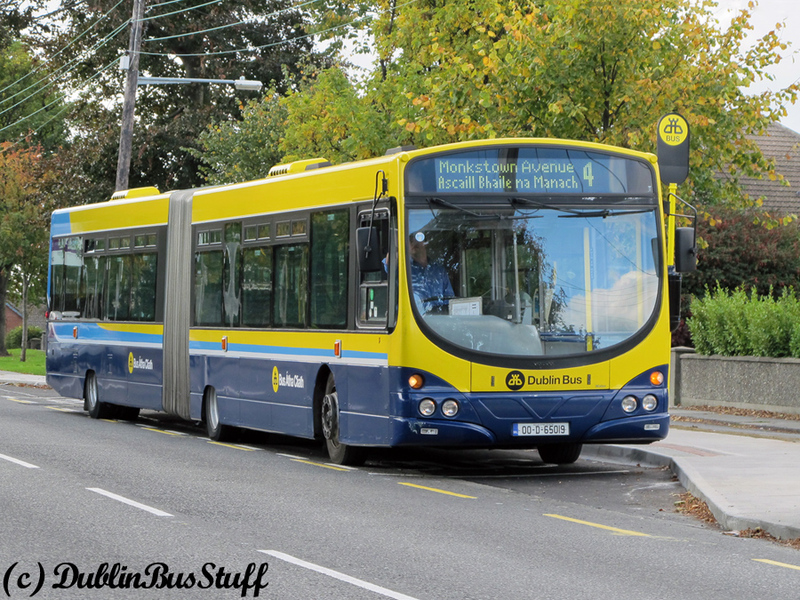 Former Harristown AW19 is seen at the then brand new Monkstown Avenue Terminus on the 20th October 2010. 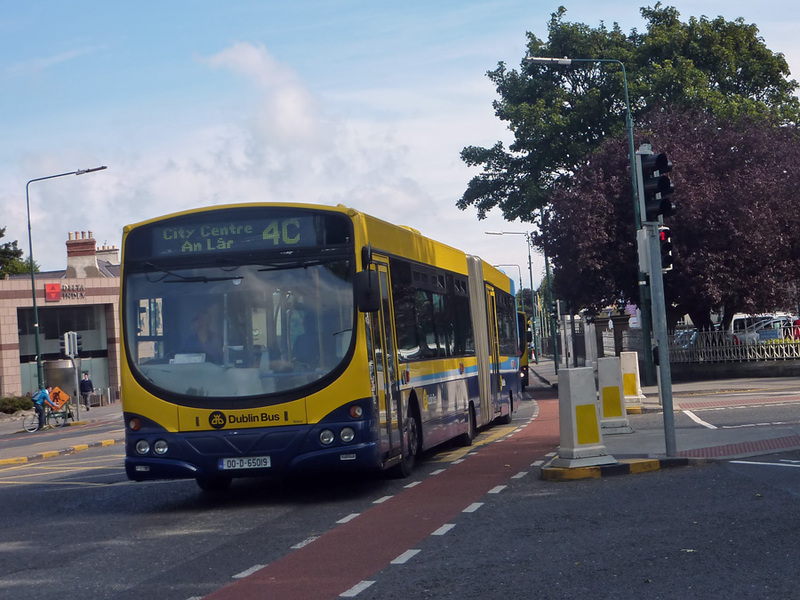 Route 4 has had a varied history, from its days as a tram route to Sandymount, its reincarnation as a "short" Route 10, and the modern day service from Ballymun to the Merrion/Rock Road corridor. These variants have basically no relation to each other, and hence the route history of this article is split into three sections, each section detailing one of the variants. The 4 was also the final home of Dublin's interesting AW-class, and the only route I ever photographed them on. 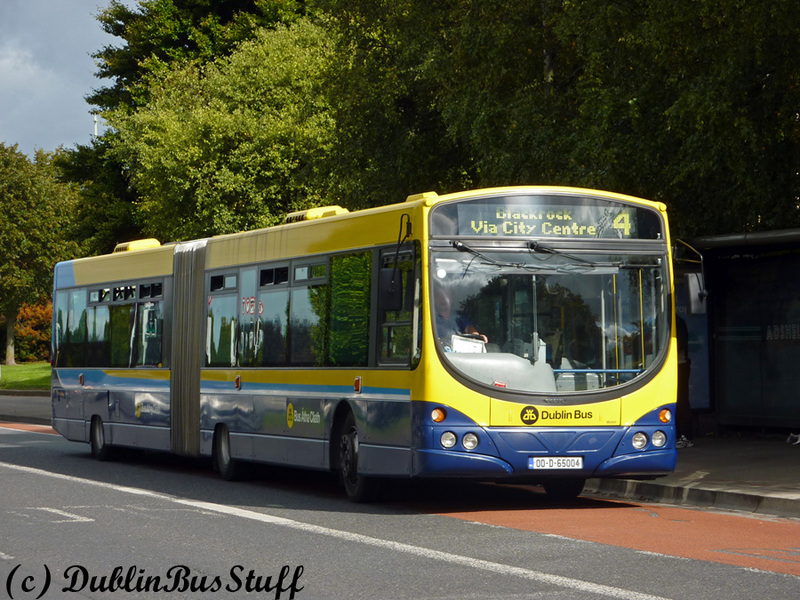 Thus this article also includes a brief history of the AW-class in Dublin Bus. Map showing the multitude of variants of Route 4 during its tram operated days (click on it for a larger version). The line only ran as far as Newgrove Avenue upon its opening on the 1st October 1872, though was extended to Sandymount Tower shortly afterwards. The depot for the line was located on the Gilford Road. The depot buildings still stand today on the Gilford Road, along with a small section of cobblestones and tram-rails. The Irish International advertising agency is currently located in these buildings, which have been nicely developed for their more modern purpose. A slight route amendment occurred in March 1873 upon the opening of the Donnybrook line by the Dublin Tramways Company. The operation saw every second tram on the Sandymount line travel via Nassau Street instead of Westland Row, with the Donnybrook line also operating in a similar fashion. This operation only lasted a few weeks, before all services on the Sandymount line returned to operate solely via Westland Row. 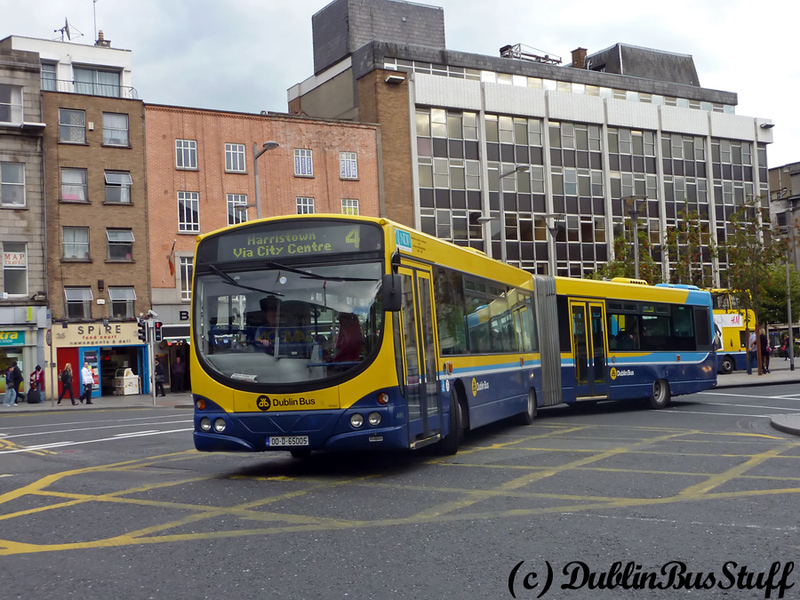 Former Harristown AW5 is seen operating Route 4 towards Harristown turning from O'Connell Street onto Parnell Street on the 17th September 2010. 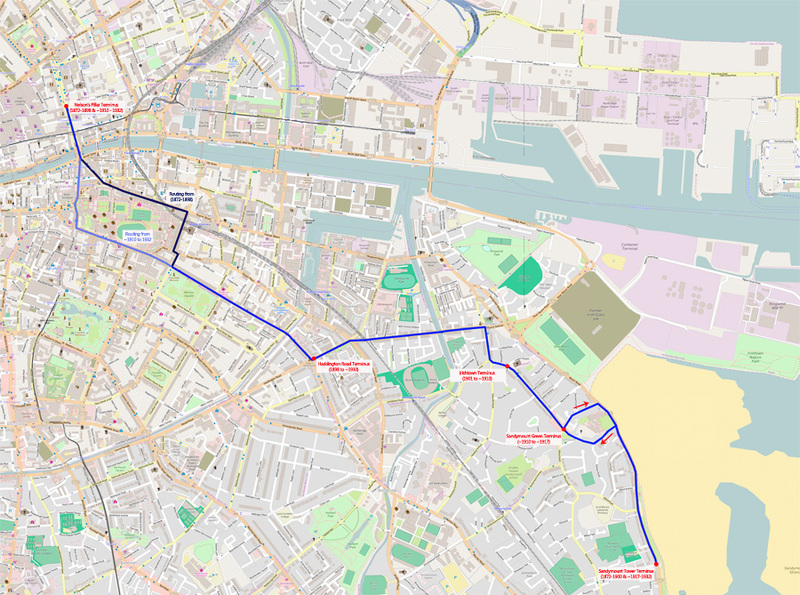 The route became part of the Dublin United Tramways Company in 1881, when the Dublin Tramways Company merged with the North Dublin Street Tramways Company and the Dublin Central Tramways Company. In July 1898, the Dalkey Line was converted to electric operation. With the electrification of this line, the Sandymount line was cut back to only operate between Beggar's Bush (the junction of Haddington Road and Mount Street) and Sandymount Tower. Initially passengers had to change trams which caused issues with Dalkey trams passing by full. The solution was to use the Sandymount tramcars as trailers to the electric trams on the Dalkey line. The line became even smaller in 1900 when the Ringsend line began operation from Sandymount Tower, the route being curtailed from Beggar's Bush to the Star of the Sea Church. At this stage it was the only horse-operated route in the Dublin system, remaining so for a full year after the electrification of the south quays line in January 1900. The tramway lines from Beggar's Bush to Irishtown were finally electrified on the 14th January 1901. The last night of horse operation was not so much lamented by the Irish Times, who noted: "The Dublin tram-horse has gone the way of the dodo. On Sunday night a pair of these time honoured animals, quietly ambling in the dusk from Northumberland Road to Sandymount, made the last journey ever to made in this city by their kind. Their loss is not likely to be greatly regretted, for there was a more medieval leisure about their pace than suits men nowadays, and the cars which they drew were neither lofty nor luxurious". 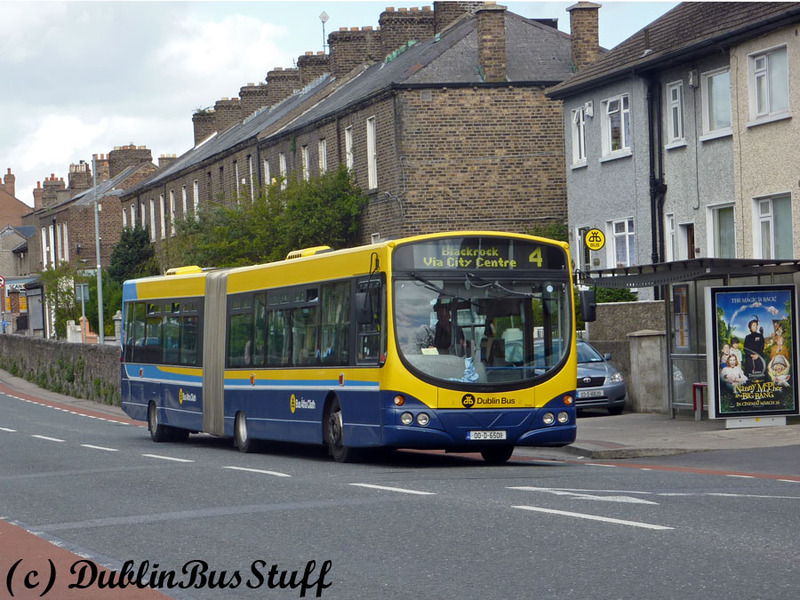 AW19 is seen operating Route 4C at Ballsbridge on the 26th August 2010. The new electric tram service was listed as Nelson's Pillar to Irishtown, but it is understood that the service continued on as before between Beggar's Bush and Irishtown (Star of the Sea Church). The railway bridge on Bath Avenue is notoriously low, however in horse-drawn days, it was operated by double-deck trams which proceeded under the bridge with caution. However, electric trams were unable to do so, and thus this tramline would be Dublin's only to be operated by single-deck trams. The cars start at Nelson's Pillar and follow Route No.1 (Dalkey line) as far as Haddington Road (where a change has to be made into cars without any top seats), along the Lower Haddington Road, Bath Avenue, under the Railway Bridge to Irishtown corner, where they join the lines of Route No. 14 (Sandymound via Ringsend line)." In 1903 the DUTC introduced a series of symbols (as opposed to numbers) that were carried on the front and back of the trams to indicate the service operated. These replaced the destination boards which had previously been carried on the sides of trams up to this point, and the idea was to counteract illiteracy among their passengers. The Bath Avenue tram however was never assigned a symbol, no doubt because its single-decker trams instantly made the route of the tram recognisable. AV447 is seen on a rare daytime allocation to Route 4A departing from the 4A terminus, which was located on the TEK roundabout, on the 24th June 2010. Around the turn of the decade (1910), the route was operating between Neson's Pillar and Sandymount Green. However, the routing at this stage was via Nassau Street, as per the Dalkey Line, and not via Westland Row. Around the mid-part of the decade (by 1917 at least), the route was extended once again to Sandymount Tower, though at this stage it had lost its Sunday service. It was the spring of 1918 that the DUTC introduced a new route numbering system to replace the symbols. 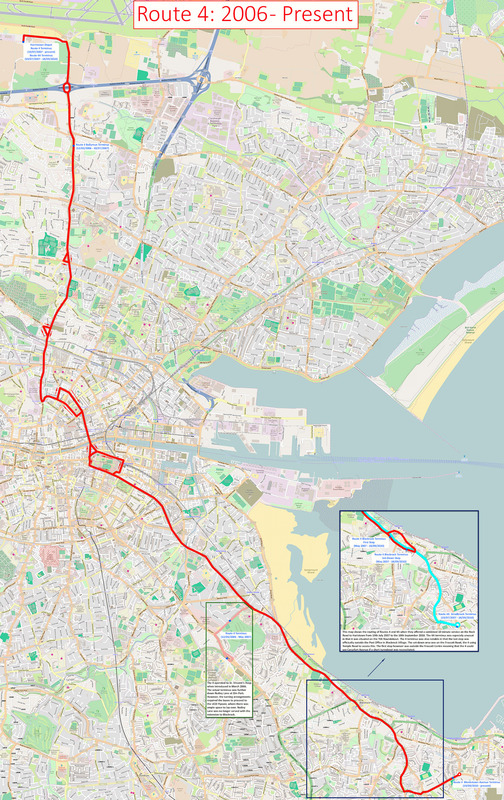 Each route was numbered based on a clockwise system, with the Sandymount via Ringsend line being numbered first (assigned numbers 1 (Ringsend), 2 (Sandymount Green) and 3 (Sandymount Tower)). The Sandymount via Bath Avenue was the next route clockwise, and was assigned Route 4. This was followed by the Merrion Road routes (5, 6, 7, 8) and so on, with the majority of this numbering scheme still surviving to this day. "Last Monday morning the residents of Sandymount and the adjoining districts awoke to find that; in obedience to a ministerial decree, the No. 4 tram – known to them familiarly as "the bogie" – had passed from their midst. Its place was filled by a fleet of shining, new omnibuses." 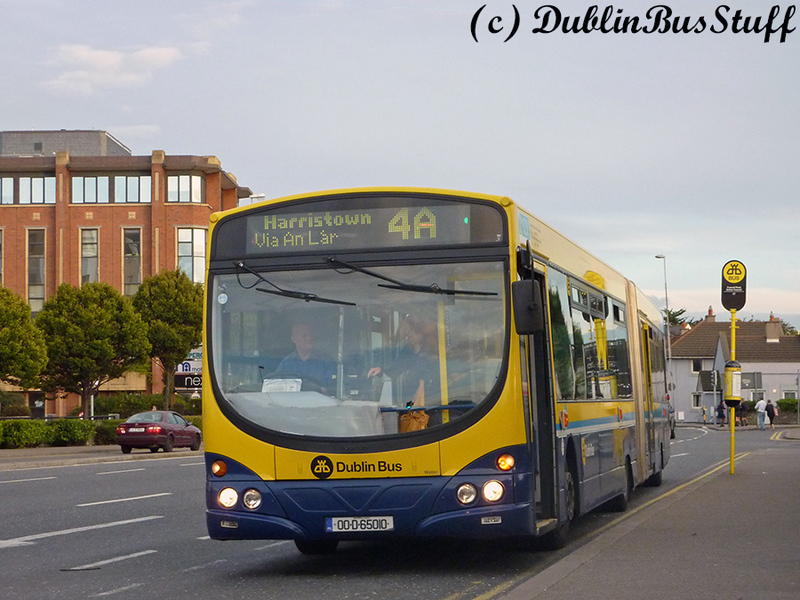 The "shining, new omnibuses" were assigned the route number 44A, with the Clontarf service of what was to become the 44A, being at the time numbered Route 44. The route operated from the City to Sandymount via Haddington Road and Bath Avenue. In 1936, there was a route number reorganisation, to attend to the multitude of acquired routes in 1934, with the 44A being assigned to the Clontarf route and Route 52 being assigned to the Sandymount via Bath Avenue route. This route would continue in this form until 1986 (except from 1941-1949 due to The Emergency), after which, except for a solitary journey on Route 46 which lasted till the late 80s, the area of Beggar's Bush and Bath Avenue has been without a bus service. AW11 is seen climbing the St. Mobhi Road about to turn left onto Griffith Avenue operating Route 4A on the 17th September 2010. The 2nd variant of Route 4 came in the form of a short Route 10 service. It began on the 28th June 1965, operating from Annamoe Road to Pembroke Road. It was worked as part of the Route 9/10 boards, and was thus operated by both Conyngham Road and Donnybrook on inception. 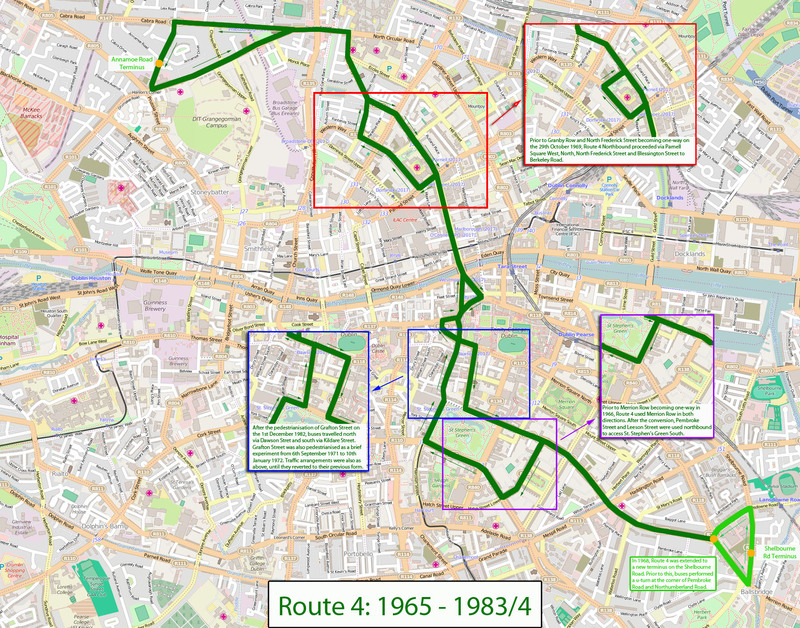 The route owes its introduction to the one-way systems that were being introduced during the 1960s by Dublin Corporation to mitigate the worsening traffic problems within the city. Map showing the multitude of variants of Route 4 while operating as a short route 10 from Annamoe Road to Landsdowne Road (click on it for a larger version). The one-way conversion of Nassau Street and Leinster Street South in November 1964 resulted in buses from Dun Laoghaire, Dalkey and Blackrock operating via Westland Row and Pearse Street to the city. This left passengers much further away from the shopping districts of Grafton Street and St. Stephen's Green than had previously been the case when they used Nassau Street in both directions. After multiple requests for a connection to be made from these districts and St. Stephen's Green, CIE decided to introduce a new route (Route 4) that would connect to them at Ballsbridge. Southbound: Annamoe Road, North Circular Road, Berkeley Road, Blessington Street, North Frederick Street, Parnell Square East, O'Connell Street, D'olier Street, College Street, College Green, Grafton Street, Nassau Street, Dawson Street, St. Stephen's Green North, Merrion Row, Baggot Street Lower, Baggot Street Upper, Pembroke Road (terminating on Pembroke Road using the wide junction at the corner of Pembroke Road, Lansdowne Road and Northumberland Road to turnabout). Northbound: Pembroke Road, Baggot Street Upper, Baggot Street Lower, Merrion Row, St. Stephen's Green East, St. Stephen's Green South, St. Stephen's Green West, Grafton Street, Suffolk Street, Church Lane, College Green, Westmoreland Street, O'Connell Street, Parnell Square East, Parnell Square North, North Frederick Street, Blessington Street, Berkeley Road, North Circular Road, Cabra Road, Annamoe Terrace, Annamoe Road. 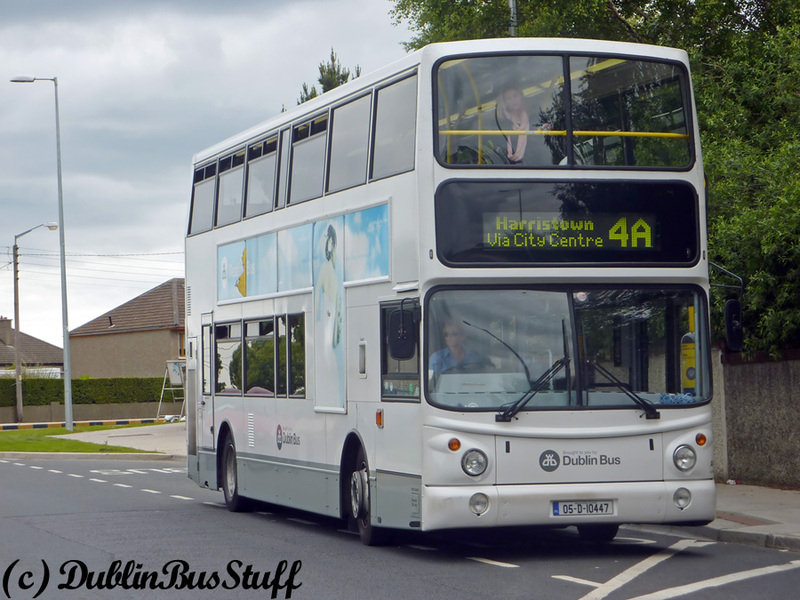 AW4 is seen at the DCU stop on the Ballymun Road on the 17th September 2010 operating a Route 4 service to Blackrock. Baggot Street Lower, Pembroke Street Lower, Fitzwilliam Square West, Pembroke Street Upper, Leeson Street Lower, St. Stephen's Green South. Pembroke Road, Shelbourne Road (Terminus – about half way between Pembroke Road and Lansdowne Road), Lansdowne Road, Pembroke Road. EV65 is seen operating Route 4 on Saturday the 22nd May 2010. Given the Monday-Friday daytime operation was the AW-class, the weekend and evening allocation was always very varied. On the 29th October 1969 major road restructuring works on Berkeley Road, Blessington Street and Berkeley Street caused a new one way system to be initiated. Berkeley Road, Berkeley Street and Blessington Street were made one way into the city, while outbound traffic to Phibsborough had to use St. Mary's Place (also made one way at this point), Western Way, Constitution Hill and Phibsborough Road. Due to the major nature of these diversions it was also decided to make Granby Row one way northbound, and North Frederick Street one way southbound as per their current arrangement. O'Connell Street, Parnell Street, Parnell Square West, Granby Row, St. Mary's Place, Berkeley Street, Berkeley Road, North Circular Road. 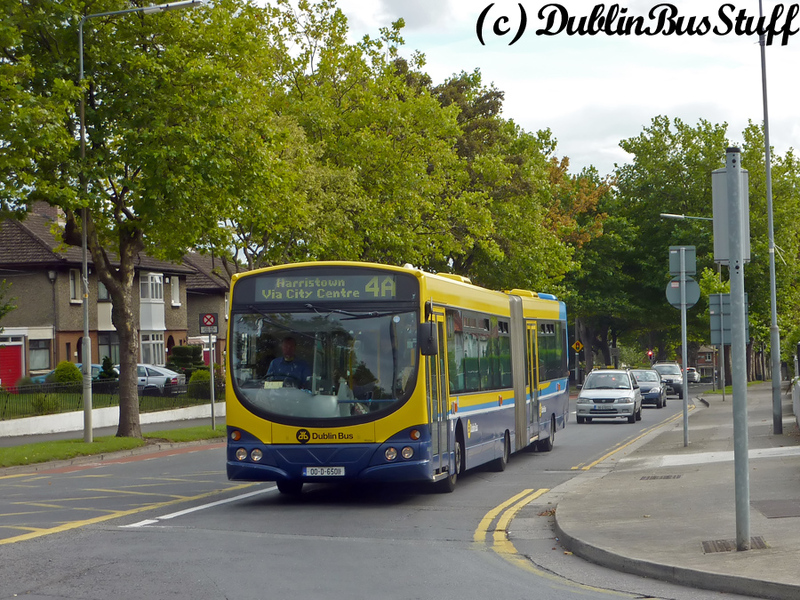 AW11 is seen operating Route 4 on the Phibsborough Road on the 24th April 2010. On the 20th June 1971, Phibsboro Garage began operation. Routes 4 and 10 were part of the first group of routes that operated from this depot from this date, thus ending their joint operation between Donnybrook and Conyngham Road. Southbound: Nassau Street, Kildare Street, St. Stephen's Green North. Northbound: St. Stephen's Green West, St. Stephen's Green North, Dawson Street, Nassau Street, Suffolk Street. Route 4 ceased in late 1983/early 1984 as part of a number of cutbacks in city routes. CIE was in financial difficulties, as was the whole country, and it was a necessity to prioritise their resources onto more profitable services. 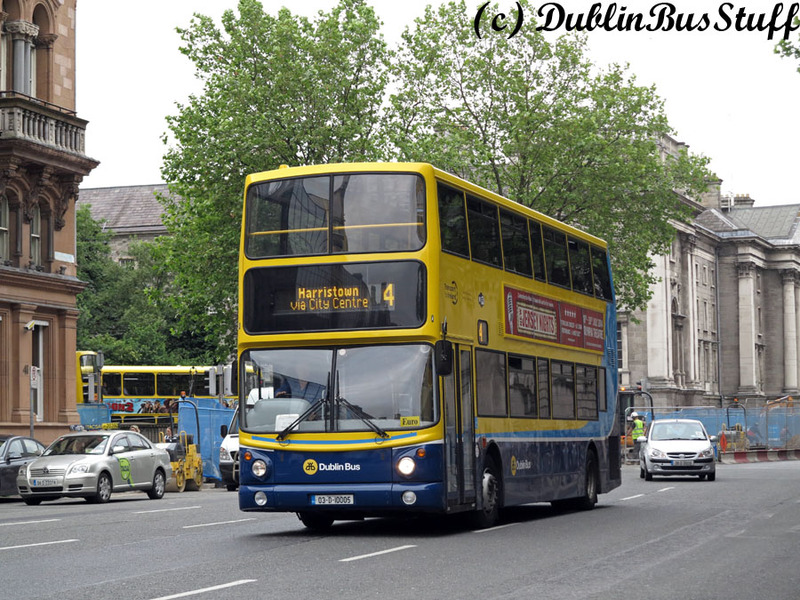 DT5 is seen operating Route 4 on Westmoreland Street on the 19th June 2014. Route 4 is a decent route to catch the unusual DT-class. DT5 is seen operating the 0830 service from Monkstown Avenue, which is operated by the Harristown 33X Euro, which is quite often DT operated, while further DTs operate short 4s from the Merrion Centre to Harristown if allocated to the corresponding duties on Route 41X. 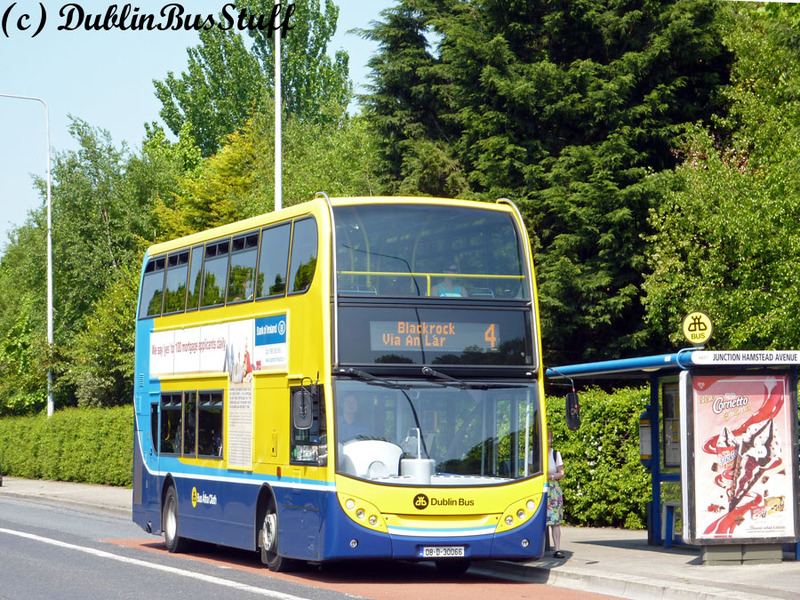 The modern day 4 has very little in resemblence to the other historical routings, albeit like the original bus service it does link Phibsborough with the Ballsbridge/Pembroke areas of Dublin. 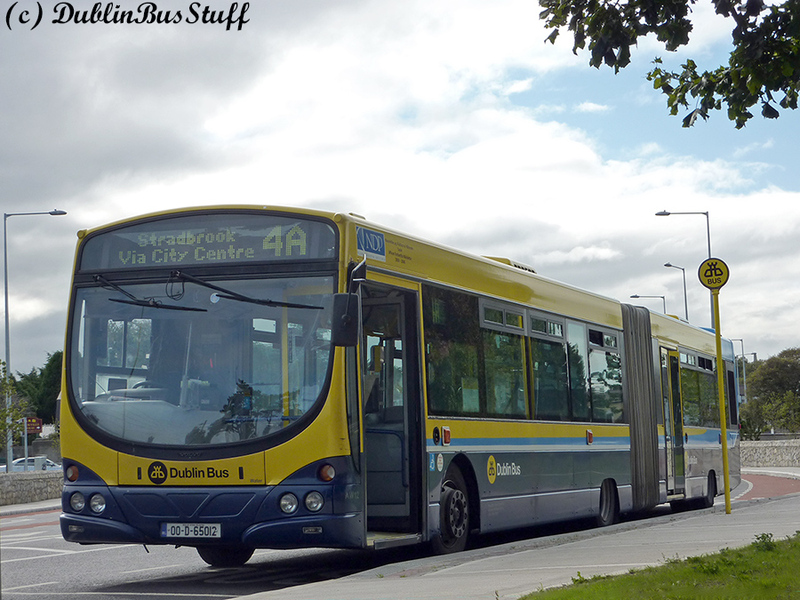 With the Irish economy booming in the mid-2000s, Route 4 was introduced to provide extra capacity on the Ballymun Road and Rock Road corridors. It was the first of a number of Transport 21 services planned, the 47, 128, 140 along with the 4/4A being the notable ones implemented. Map showing the Route 4 and 4A routings of the modern Route 4 which began in 2006. The 4 was introduced on Sunday 12th March 2006 operating from Ballymun to St. Vincent's Hospital. The daytime frequency was every 15mins. The route was allocated the AW-class, Wright Fusion articulated buses, which had transferred to Harristown upon its opening, and operated solely on Euro peak-hour services. The Ballymun terminus was on Ballymun Road at the Nursing Home. 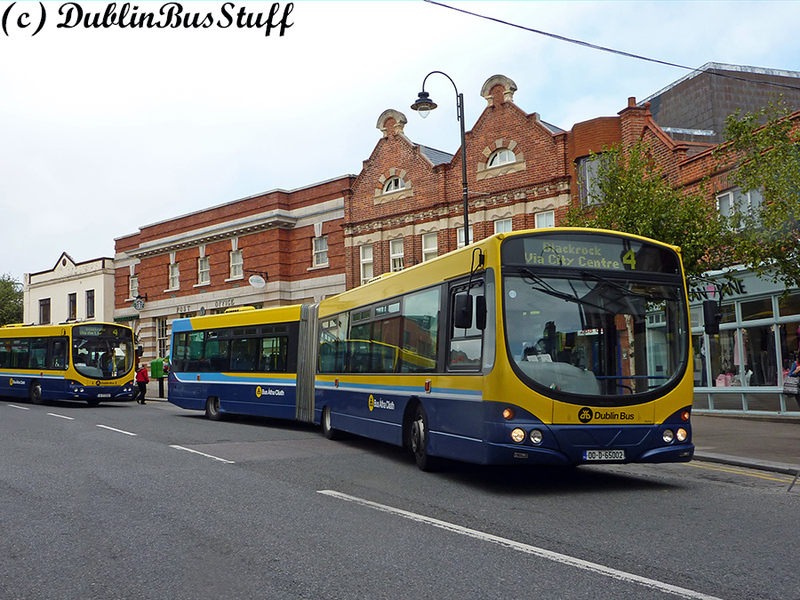 To turn about the buses could have used the M50 flyover, however with driver changes at Harristown Depot, and decent running time, most buses would continue to Harristown Depot. The official destination on the southside was St. Vincent's Hospital. Buses were unable to terminate in the hospital however, due to the lack of suitable splace, however it was expected that a terminus would be provided as part of then ongoing developing in the hospital. The buses continued along Nutley Lane, the terminus being at Elm Park. Once again, the buses had to continue along this road onto the Stillorgan Road to turn about using the Belfield flyover. It seemed a bit of a lost opportunity that buses did not do this in service, however it may well have been due to not providing a service that would be removed once a suitable terminus was provided at the hospital. Southbound: Ballymun Road, St. Mobhi Road, Botanic Road, Prospect Road, Phibsborough Road, Constitution Hill, Western Way, Mountjoy Street, Blessington Street, North Frederick Street, Parnell Square East, O'Connell Street, O'Connell Bridge, D'olier Street, College Street, College Green, Grafton Street, Nassau Street, Leinster Street South, Clare Street, Merrion Square North, Mount Street Lower, Northumberland Road, Pembroke Road, Merrion Road, Nutley Lane (terminating at Elm Park). Buses continued to Belfield fly-over to turnabout and lay over. Northbound: Nutley Lane, Merrion Road, Pembroke Road, Northumberland Road, Mount Street Lower, Merrion Square North, Clare Street, Lincoln Place, Westland Row, Pearse Street, College Street, Westmoreland Street, O'Connell Bridge, O'Connell Street, Parnell Street, Parnell Square West, Granby Row, St. Mary's Place, Western Way, Constitution Hill, Phibsborough Road, Prospect Road, Finglas Road, Prospect Way, Botanic Road, St. Mobhi Road, Griffith Avenue, Ballymun Road (terminating at Domville Nursing Home). Buses typically continued to Harristown, but out of service. AW2 and AW19 are seen at the Blackrock Main Street stop of Route 4 on the 15th September 2010. The 4 and 4A suffered from bunching, with the AWs limited in their ability to weave through traffic and overtake other AWs. These buses would have departed Harristown 20mins apart. Merrion Road, Rock Road, Rock Hill, Blackrock Main Street (last stop at Post Office). Buses continued along Temple Road, turing right onto Frascati Road to lay-over at a stop after the entrance to Blackrock Business Park. First stop northbound was at the Frascati Centre on the Frascati Road. Return via Rock Road to Merrion Road. AW12 is seen laying over at the Stradbrook terminus on the 15th September 2010, a few days before the withdrawal of Route 4A. Route 4 was extended to operate in service to Harristown Depot in November 2007. As part of these changes, Route 4A was also introduced. This was an extension to Route 4 to the Stradbrook area, terminating on the Monkstown Link Road. This road had been the terminus of Route 6 before its withdrawal in the 80s. The terminus was on the TEK roundabout, an unusual location. With the new service, the 4 and 4A now offered a combined daytime frequency of every 10mins along the Ballymun and Rock Road corridors, each service on a 20min headway. Again this service was operated by AW-class buses. The original date for the new route introduction was the 12th November 2007. However, their was a dispute with regards to the newly introduced bill. The new bill required for driver changes in the city centre, a first for the Harristown depot since it opened in October 2004. Up to this point, driver changes (shift breaks, starts, finishes) could only occur at the depot. The very first duty did make it out in service briefly, operating Route 4. This was because this duty just so happened to finish in the depot, thus this was the first 4 service officially operated from Harristown depot. However, when the 2nd duty was refused, an official strike began which ceased Harristown operations for a full week. Rock Road, Frascati Road, Temple Road, Temple Hill, Stradbrook Road, Deansgrange Road, Monkstown Link Road (TEK Roundabout), Deansgrange Road, Stradbrook Road, Temple Hill, Temple Road, Frascati Road, Rock Road. AW10 is seen operating the last AW departure on Route 4A on the 17th September 2010. Route 4A would finish the following day, however by this time the AWs only operated up to after the evening peak on Monday-Fridays before being swapped for something else. Typically this would initially be Euro buses returning after their evening operations. Sure enough the next bus after AW10 was DT1 on the 4. The failing Irish economy lead to a long period of restructuring and service reductions. This begain in April 2009, mostly with the removal of a number of peak-hour and under utilised routes. Work continued on a major network restructure, which was advertised to passengers under the guise of "Network Direct". Route 4 and 4A were ammended as part of the 1st phase of Network Direct on the 19th September 2010. Under this restructuring, the routes were merged into one Route 4 from Harristown to Monkstown Avenue, the 4A being withdrawn. The extended 4 covered the entire length of Route 4A to the Monkstown Link Road, but was further extended to Monkstown Avenue. This road had previously been served by the 46A services, which had up until this date traveled via Monkstown Farm. The terminus is further along Monkstown Avenue than the 46A had served near Monkstown Castle. The daytime frequency was reduced back to 15mins, however Saturday and Sunday services were severely reduced with a 30min service on Saturday (with a first bus from Monkstown only at 9am), and an hourly service on Sunday. This was a reduction of 2/3 of the Sunday frequency on the 4/4A services. Interestingly, the announced routing for this new amalgamated Route 4 indicated that buses would travel via Blackrock Village southbound. In fact, the 4A stop on the Frascati Road (stop 6334) was removed. However, buses have only used the Frascati Road in both directions since the amalgamation, serving the hole in the ground where the stop once stood until it was reinstated. This service has continued in this form to the present day, however the AW-class would slowly dissappear from the route, the last finally being withdrawn from the fleet in very early January 2011. The route then was operated primarily with AVs of 2000 vintage, before receiving GT-class vehicles in 2012, and being primarily upgraded to SG-class in 2014. 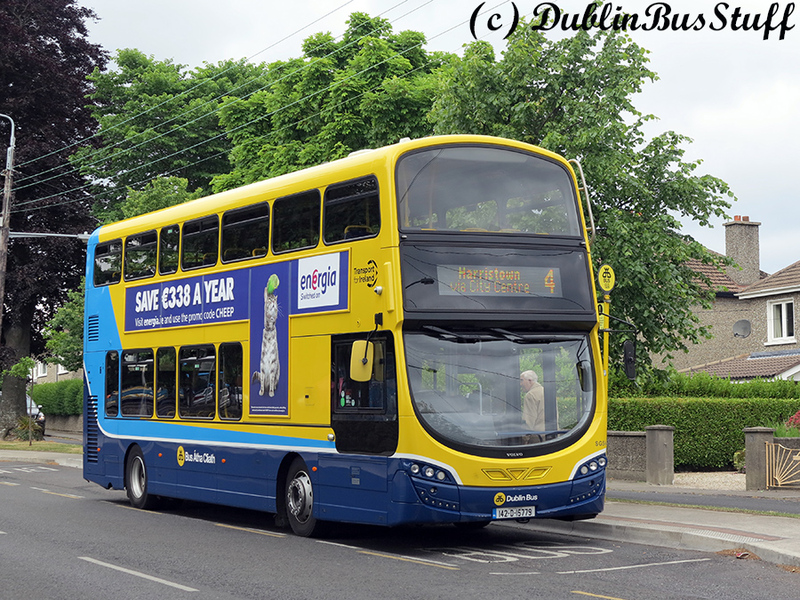 SG54 is seen operating Route 4 on the 25th June 2015 at the Monkstown Avenue terminus awaiting its return service to Harristown.